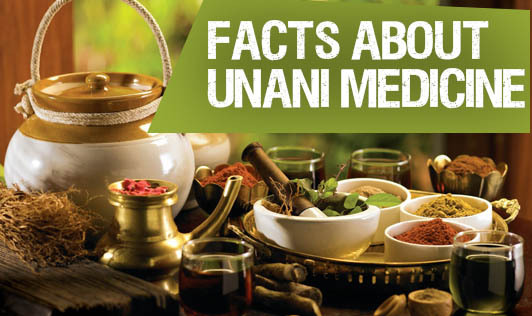 Unani is a form of medicine that traces its roots to Greece in the days of Hippocrates, between 460 and 377 BC. "Unani" was derived from the word "Ionian" which indicates its origin to Greece. Unani system of medicine is a synthesis of Greek & Arab systems. Unani got enriched by imbibing what was best in the contemporary system of traditional medicine in Egypt, Syria, Iran, Persia, India, China and other Middle East and Far East countries. It is consistent in many ways to that of Ayurvedic medicine. Unani is built on achieving health and wellness through combining a variety of medical systems, including natural and homeopathic treatments as well as the use of drugs. Focus on 7 components: Arkan or anasir (elements), Misaj (temperament), Akhlat (humors), Aza (organs), Arwah (vital spirit), Quwa (faculties of power) and Al-Af'al (function). Goal: preserving health - in other words, preventive medicine. Regimental Therapy includes venesection, cupping, exercise, steam bath and leeching. Diet Therapy prescribes specific dietary measures based on the person's condition. Pharmaco therapy treats diseases using drugs. The goal is to use drugs that have origins in nature, but more complex chemical formulae can also be used. Surgery is the fourth treatment, but is only a last resort. A popular remedy in Unani is kalonji oil - used from eye disease to vomiting. Others are Ajwain (digestion issues, toothaches, mouth infections and earaches), coconut oil (wound care), mustard oil (burns), black pepper (incontinence) and coriander seeds (headache).